Hello goregoeus! 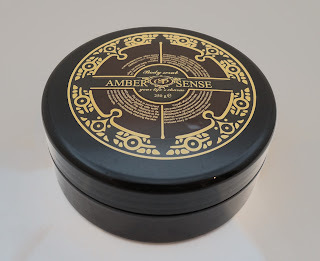 I am going to continue to tell you about my favorite Latvian cosmetics :) This time it is coffee scrub (for body) form Ambersense. I love it for the amazing coffee aroma. This is just incredible! It makes me feel like I am sitting in front of fireplace wearing my favorite warm cardigan :) It is so warm and cozy :) Coffee scrub is SLS free, scrub is enriched with high-quality oils (jojoba and macadamia nut), which have salutary effect, it contains natural antioxidants and promotes rejuvenation of skin, the salt of Scandinavian fjords gently cleanses the skin of dead cells. Coffee is also natural antioxidant and have anticellulite effect :) If you are interested in full (and quite long description of the product please visit Ambersense homepage. Sveikas, daiļās! Turpināšu iesākto tēmu par Latvijas produktiem. Kārtējais ziemas favorīts man ir kafijas skrubis no Ambersense. Un šoreiz tieši tāpēc, ka tas ir izcils ziemas produkts. Kafijas aromāts ļauj man justies tā, it kā es esmu ietinusies siltā džemperī un sēžu blakus kamīnam. Pilnu (diezgan garu) produkta aprakstu var izlasīt ražotāja mājaslapā. Ingredients: Sea salt, Glycerin, Natural coffee, Simmondsia Chinensis(Jojoba oil), Demineralised and Delactosed Whey Powder, Sucrose, Aqua, Sodium Cocoyl Isethionate, Sorbitol, Macadamia ternifolia seed oil, Propylene Glycol, Disodium Lauryl Sulfosuccinate, Aroma, Tocopherol acetate, Sodium chloride, D-panthenol, Phenoxyethanol, Ethylhexylglycerin, Tetrasodium EDTA, Denatonium benzoate. P.S. skrubīti pirku Jelgavā, veikalā dbdaba, cena bija ap 7.80 Ls.